Dr. Sveta Yamin-Pasternak, PhD, is a Postdoctoral Fellow in Polar Regions Research at the National Science Foundation and Visiting Scholar, Department of Anthropology, Johns Hopkins University. Sveta Yamin-Pasternak is originally from Belarus, but her interest in the peoples of the Arctic brought her to Fairbanks, Alaska where she pursued a PhD degree in cultural anthropology. 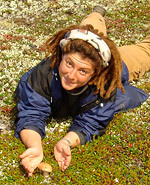 Early in her studies, she took note of the fact that, while sharing a common array of subsistence foods, the indigenous residents of northern Russia and Alaska have strikingly contrasting attitudes toward mushrooms. Searching for possible explanations fueled her fascination with ethnomycology, which has become the main subject of her research. Her dissertation, entitled �How the Devils Went Deaf: Ethnomycology, Cuisine, and Perception of Landscape in the Russian North,� focuses on the peoples of the Bering Strait area, documenting their folklore, beliefs, and practices associated with wild mushrooms. Bring your wild mushroom find to be ID'd it may be edible or medicinal! ©Copyright 2006-2015 Sustainable Habitats, LLC All rights reserved.